The 9th season of Polish Cinema for Beginners is on – we are travelling along the footsteps of Polish filmmakers. 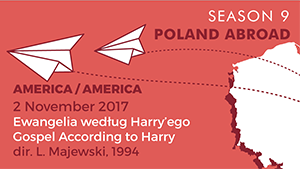 After France (“Danton”) and Sweden (“Strange Heaven”), we will visit the United States of America – this Thursday in the New Horizons Cinema, we will see Lech Majewski’s “Gospel According to Harry”. Our special guest will be the director of the film. America in the early 1990s, or rather a surrealist space of the Californian desert, with scattered furniture, computers and household appliances. This is where Wes (a young Viggo Mortensen) lives with his wife Karen (Jennifer Rubin), who is trying to persuade her husband to enlarge their family. Her mother (Rita Tushingham) comes to support her daughter, then Harry (Jack Kehoe), a tax clerk with a number of questions about the Wes’s tax return. This is just the beginning of strange events that director Lech Majewski, filmmaker, painter and writer, one of the most original Polish artists, set on Wes in the movie. Majewski’s rich metaphorical visual language, typical for his films, absurd humour and the music of an Oscar laureate, Jan A. P. Kaczmarek, stand out in Gospel According to Harry. Made in collaboration with David Lynch‘s studio, this independent production began Viggo Mortensen’s great career. The special guest of the third screening of the 9th season of the Polish Cinema for Beginners will be Lech Majewski - director, scriptwriter and film producer, poet, writer and painter. Member of the Directors Guild of the American and European Film Academy, author of such films as “Basquiat” (1996, script), “Wojaczek” (1999, award for directing in Gdynia), “The Garden of Earthly Delights” (2003) and other titles presented at film festivals in Cannes, Venice, Berlin, Toronto, Rome and Rio de Janeiro. The meeting will be hosted by Adam Kruk, film critic and journalist, who is responsible for the Polish Cinema for Beginners programme. The screening of “Gospel According to Harry” will take place in the New Horizons Cinema on the 2 November at 8 pm. Tickets can be purchased before the screenings at the ticket offices and at KinoNH.pl website. More information about the project can be found at: PolishCinema.com.pl and facebook.com/PolishCinema. You are invited to the Polish Cinema for Beginners by the Wrocław Film Foundation.